Honda Aircraft announced at EBACE 2014 that the first production HondaJet is expected to make its maiden flight this summer. It is shown here sporting a new “deep pearl green” paint scheme, which is now offered to customers along with blue, yellow, red and silver. Progress on the HondaJet continues toward the model’s planned certification in the first quarter of next year, Honda Aircraft (Booth 6559) announced at EBACE 2014 on Monday. The first production HondaJet (S/N 11) is now in final assembly in the company’s manufacturing facility on Piedmont Triad International (PTI) Airport in Greensboro, N.C. The first flight of S/N 11, now ready for ground tests, is expected this summer. FAA type certification of the HondaJet is planned for the first quarter of next year, with EASA certification to follow in about six months. The first HondaJet prototype made its first flight from PTI in December 2003. The first set of GE Honda Aero Engines HF120 production turbofans, which were recently delivered to Honda Aircraft, are installed on HondaJet S/N 11. This aircraft also sports a new exterior color scheme that Honda Aircraft describes as a “deep pearl green with a gold stripe.” Other exterior colors offered for the innovative twinjet, which seats up to five passengers in the cabin and includes an enclosed lavatory, are blue, yellow, red and silver. Asked what his main priorities are for Honda Aircraft, Michimasa Fujino, president and CEO of Honda Aircraft, told AIN, “The first milestone is to get type certification. The second is to deliver the first aircraft after FAA certification is granted. Also, we want to increase deliveries of aircraft according to our ramp-up plan. So our suppliers and the assembly [process] have to be sufficient to support an efficient ramp up.” The company reports orders for more than 100 aircraft, but has not yet announced a launch customer. About two-thirds of the orders are from North America with the rest European. Current price of the HondaJet is $4.5 million. Nine HondaJets are now under assembly, with four of them already mated to their wings and empennages. The company’s goal is to have the assembly line at full capacity (10 aircraft) in June. The production build-up is in line with Honda Aircraft’s objective to have six airplanes ready for delivery immediately after aircraft type certificate is awarded. Fujimo expects 50 to 55 aircraft to be delivered in the first 12 months after deliveries begin. He said the goal is to maintain a two-year order backlog and that it will take three years to ramp up to the production facility’s capacity of 80 aircraft per year. Honda Aircraft, which has already engaged more than 100 suppliers, also announced at EBACE that Fokker Aerostructures will supply the empennage for the HondaJet. In December last year the FAA issued the first type inspection authorization (TIA) for the HondaJet and also certified the company’s customer service facility as a Part 145 repair station. Issuance of the TIA means that an aircraft meets type design requirements and is ready for FAA pilots to begin certification flight testing. The HondaJet began TIA flights in January. TIA flight testing conducted to date includes stall speed, stall characteristics and the stall warning system; wheels, tires and brake control system; flap actuation and speed-brake operation; hydraulic system checks; and inflight fire suppression. Water ingestion, cold-weather and low-level lightning testing have also been completed. Meanwhile, two HondaJet prototype aircraft have undergone more than 2,000 cycles of full-scale fatigue testing, equivalent to more than five years of typical use by a business aircraft operator, on a structural test rig. 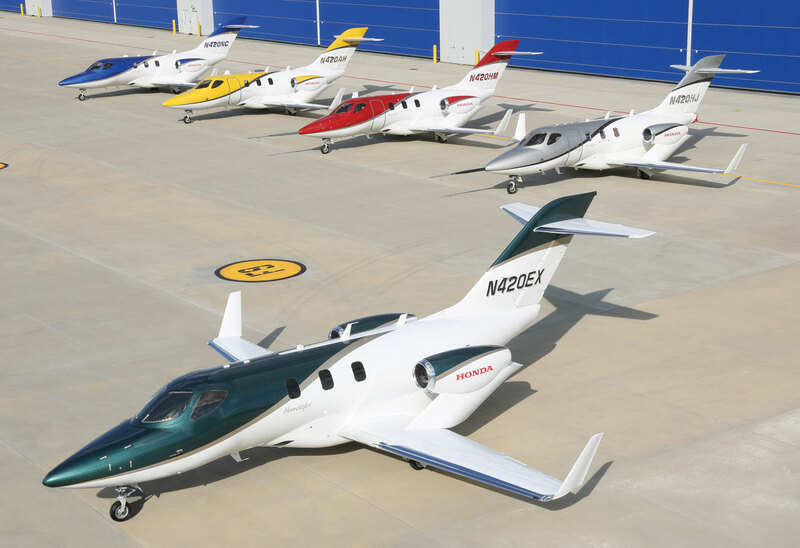 Another Honda Aircraft milestone is to make sure customer service is ready, “meaning distribution, parts and service are in place before we deliver the first aircraft,” Fujino said. In addition, “we need to have pilots training in the flight simulator.” FlightSafety International is providing the level D full flight simulator and is working with Honda Aircraft to develop flight and maintenance training curriculums. Maintenance training classes are due to begin later this year. Delivery of the simulator to Honda Aircraft and flight training are expected before the model’s entry into service. Honda Aircraft’s 133-acre “campus” on Piedmont Triad International Airport now includes the company’s research and development center, administration building, manufacturing facility and customer service center, and currently employees nearly 1,000 people, with ample room for more. GE Honda Aero Engines is based at Burlington Alamance Regional Airport, also in North Carolina, about 35 miles east of PTI. HondaJet dealers are in place in the northwest, southwest, midwest and southeast regions of the U.S., Mexico and northern, southern and central Europe.